Ready for a bloody good meal (i'm being literal here)? 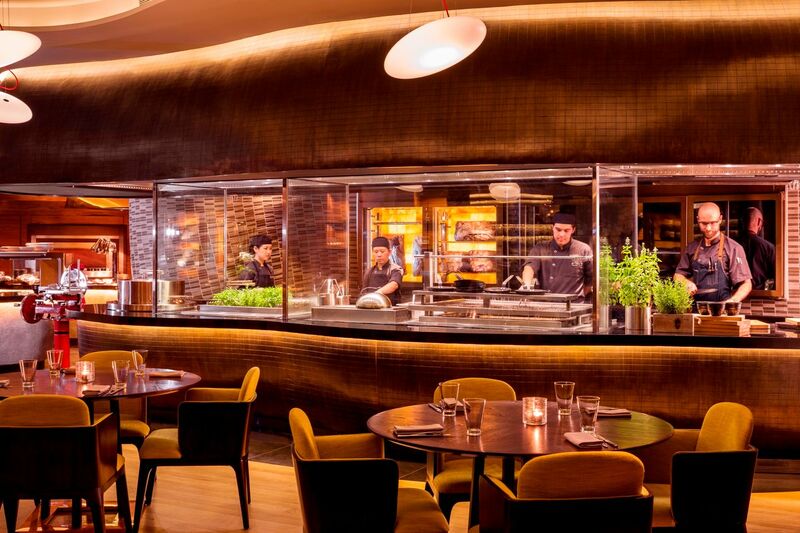 Diners can look forward to the bloody gorgeous selection of premium Australian Prime Cuts at Opus Bar & Grill. We're talking about a 4 to 6 marble score Himalayan salt dry-aged OP rib, Wagyu Rib-eye, and Tajima Wagyu beef, expertly cooked over the open-flame charcoal grill, to be accompanied by Pierre Jean wines (they have an ongoing drinks promo till 31 Mar 2016)! Actually there's more to the menu than just beef. 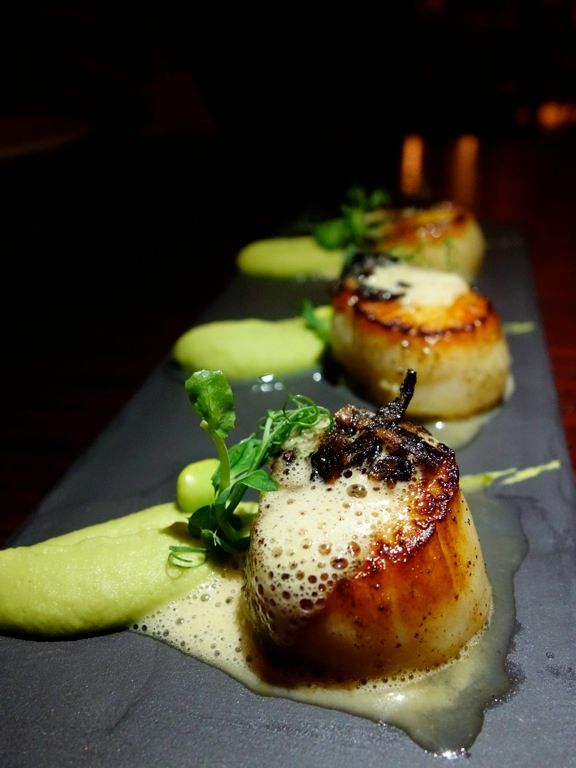 Opus Bar & Grill has recently refreshed their menu and here is what you can expect along with your reds. Definitely start with some Hokkaido Scallops ($22) with edamame, blood sausage, and miso espuma. The sear on the plump shellfish was simply amazing and you get a touch of that smokiness from the blood sausage (it's really nothing scary). Seafood at Opus are from sustainable sources and they are also the first restaurant in Singapore to be awarded the MSC ecolabel. We also enjoyed the Japanese style Tartar of Blue Fin Tuna ($17) with avocado, trout roe, and extra virgin olive oil. It's kinda like a deconstructed California Roll without the carbs. 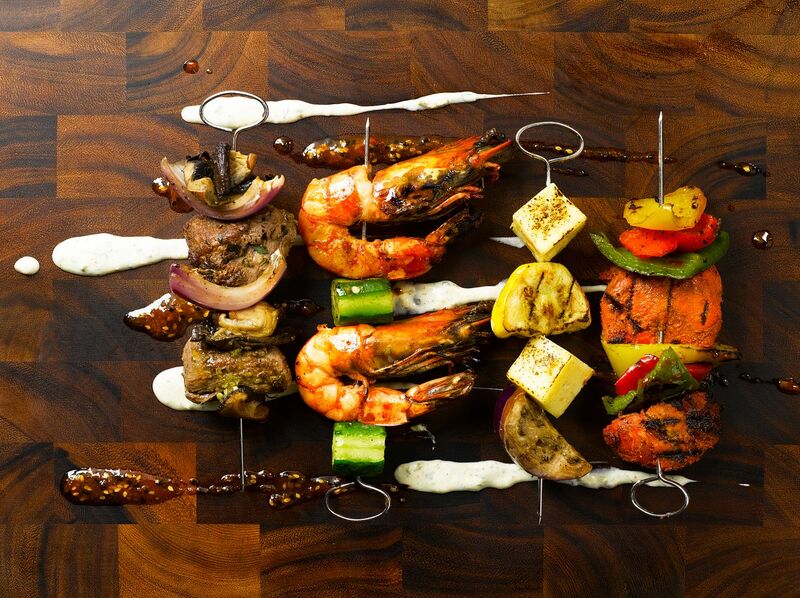 If you like your food on sticks, then order some of the Opus Grilled Skewers. We enjoyed the King Prawn Skewer ($20/30) which came with the yummiest Thai style green chili sauce. Vegetarians could have the Grilled Halloumi kebabs ($16/22) with squash, eggplant, and picada dressing. Now back to the meats! Opus ages their meat between 14 - 36 days in a specially commissioned Himalayan salt tile cabinet before firing them over the charcoal grill. 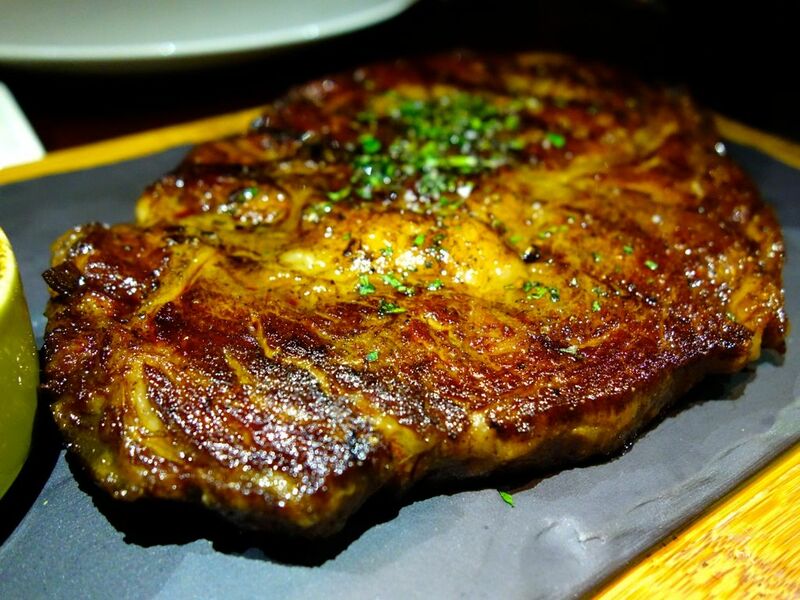 A hot favorite is the 800g Australian Rangers Valley Angus OP Rib dry-aged with a marble score of 4 ($110). This huge slab is done medium and is perfect for 2 hungry person. I'm a medium rare girl and thus i found this a tad too dry and tough but the boys loved this. 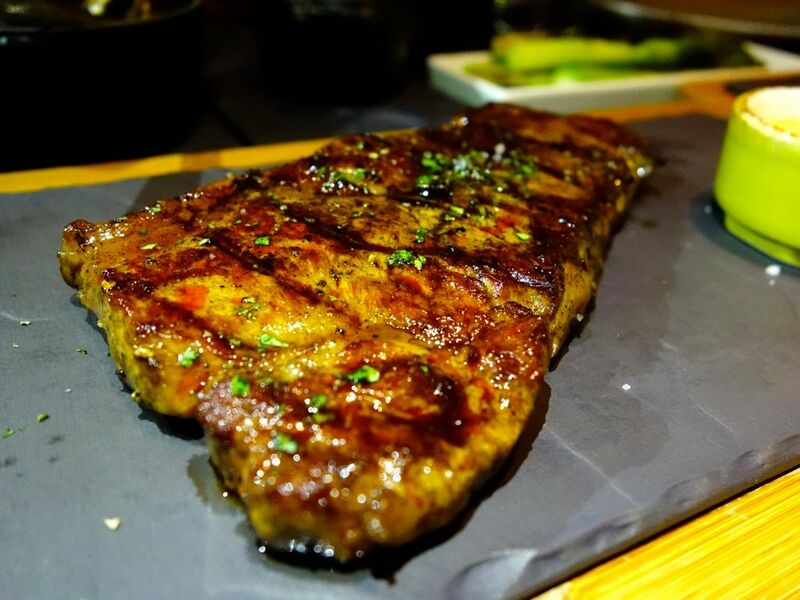 The 220g Australian Tajima Wagyu Sirloin ($88) of Marble score 4-5 was super tender and easy to eat. My favorite was the 220g Australian Wagyu Ribeye ($92) of Marble score 6. Really love the juicy cut and it's the most tender of the lot. The meats are good on their own but certainly you can't miss the Black truffle & mushroom sauce! For sides ($6 ea), i'd skip the Smoked Risotto which was way under cooked (i know what al dente is) and the Mac & Cheese (a tad dry though rich). The portobello and grilled asparagus were satisfying enough for a balanced meal. Or make it a Steak Frites with a side of truffle fries perhaps? 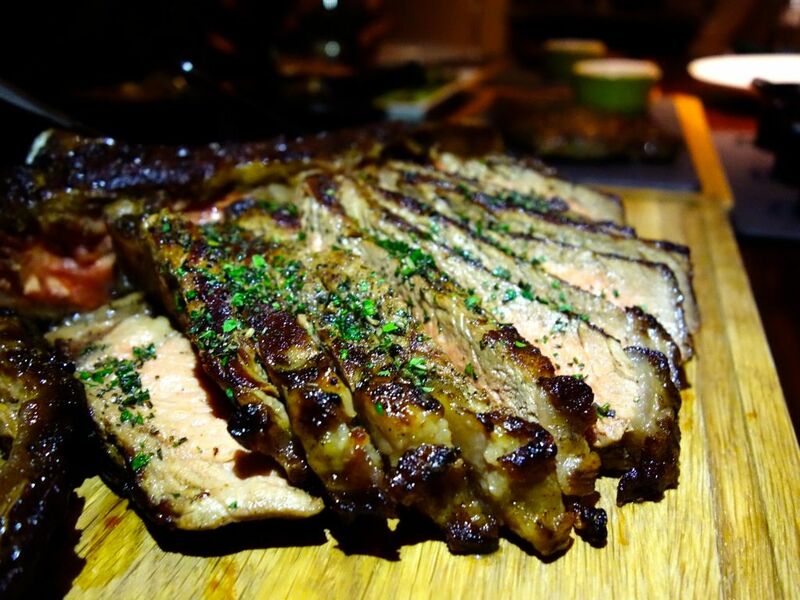 If you're not a beef fan, there are other seafood and meat options too, like the 36 hours pork belly ($36) with ginger pumpkin puree, Hosin & sesame glazed rack of lamb ($46), or the Herb-roasted Spatchcock ($32). I was swooning over the Glacier 51 toothfish fillet ($49) with its firm and succulent meat swimming in that deliciously smooth and umami brown butter dashi sauce flavored with the smoky charred leek. I would come back for this!! 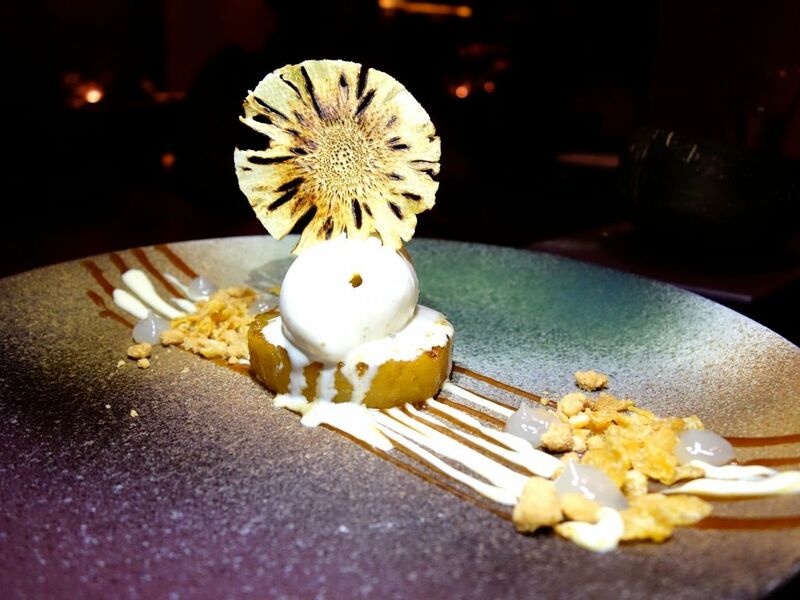 For desserts, new dishes include the Grilled Honey Pineapple ($12) with crumble, paired with a creamy vanilla ice cream. This was a smooth but refreshing dessert to end the night. Or perhaps a Charcoal grilled banana ($12) with smoked salted caramel and coconut calamansi sorbet? I prefer my coconut ice cream pure and sweet though. Till 31 Mar 2016, enjoy special beverage offers with any order of Opus Beef Selection (Prime Cuts from $58 only). The offer includes free flow of sparkling, white & red wines from 7pm to 9pm (Mon to Thu) and 50% off on wine by the bottle (Fri to Sun).